‘Is Taylor Swift really swift?’ With this crowd-sourced question pulled from a top hat, the audience of Play This Show! loaded up Publish or Perish and took control of luckless PhD student, Tom, to start their journey into the world of fantasy academia. As ever, the course of good research never did run smooth. Together, the audience faced down nagging undergraduates, impossible deadlines, shadowy senior management figures, office equipment come to life, and overcame them all. They drank coffee, they let down their friends, they gained and (mainly) lost health, they even became a fantastic machine for measuring cow manure. They survived. Just. Thanks to everyone for coming and being such willing participants of this weird, hard-to-describe show. Putting you in control of the action can feel terrifying so we were genuinely blown away by the generous response and the imagination you demonstrated throughout. Huge thanks also to Alistair Aitcheson and his Incredible Playable Show in the second half- Who knew we’d all enjoy becoming supermarket managers so much? Enjoy the pictures of the nonsense below (thanks to James Pepper for the photography) and look out for the next chance to ‘Play This Show’! We’re teaming up with award-winning game developer Alistair Aitcheson to bring you Play This Show, a night of playable and improvised comedy featuring two shows like nothing else on stage- well, like nothing else on a Thursday night in April anyway. Publish or Perish is the choose-your-own-adventure show where the whole audience gets to play together. Alongside your friends, you’ll take control of a young scientist trying to make it through the strangest day of their life, guided by the all-knowing game master. After a fantastic couple of shows at Green Man Festival 2017, we’re really excited to be bringing this show to a hometown audience at the brilliant Bristol Improv Theatre. And if you caught it last year, there’ll be new cast members, new games and even more pop culture surprises to challenge your spur of the moment decision making skills. After a busy 2016, Rising Ape squeezed one more event in before the end of the year. A freezing, foggy 1st of December saw a small, boisterous crowd weathering extreme elements, limited visibility and the Conan Doyle-ish Capital D dread of it all to make it down to the Bristol Improv Theatre. There, together they became the audience for, well, The Audience. Guided by courtroom algorithm ALIX, the Audience became shaped into a cohesive unit, passing judgement on the sentence for a dramatic court case, and getting a glimpse into what justice in the future might be like. The immersive experience aimed to get people thinking about the consequences of trusting machines with our thoughts and biases. And all through the brandishing of LED lights and making friends with a slightly sarcastic A.I. Antony Poveda, Producer for Rising Ape Collective and member of the cast. Together the experts and audience discussed how far we are willing to trust algorithms with important decisions, personal experiences of the effectiveness of juries, and how little society is aware of the companies behind the technology we give data to. The engaging and highly productive session was filmed and we’ll be publishing the full video later in the New Year. This production of The Audience was also incredibly valuable from our viewpoint. Learning from the performance at Green Man, we took the opportunity to tighten the script, take advantage of the new venue to really up the atmosphere (the mist certainly helped a bit there), choreograph new immersive moments, and, best of all, discover how well the performance works as a stimulus to get an audience talking with experts about these timely issues. Want to experience The Audience for yourself? Follow us using the button below and look out for news of performances in 2017, as well as the film of the panel discussion, coming soon. Your voice is ‘important’ to us. MSG BEGINS: Dear Citizen. Fresh from being the most packed, “disturbing”, and ethically confusing interactive show of the Green Man Festival Einstein’s Garden tent, The Audience is hitting Bristol with a heady mix of mob rule, computer smart-arsery and LED lights. In the latest immersive show from Rising Ape Collective you’ll meet ALIX, the friendly courtroom AI, and get to have your say on what society thinks is morally right and wrong. The show will be followed by a Q&A with the writers and a panel of local researchers ready to discuss your questions on the future of AI, our legal system, and whether robots will take all our jobs. Attendance is voluntary, yet strongly advised. Please respond to your video invite, ALIX can’t wait to meet you. More details, and RSVP on the event page. Eruption! ft. Nicky Young… The Movie! 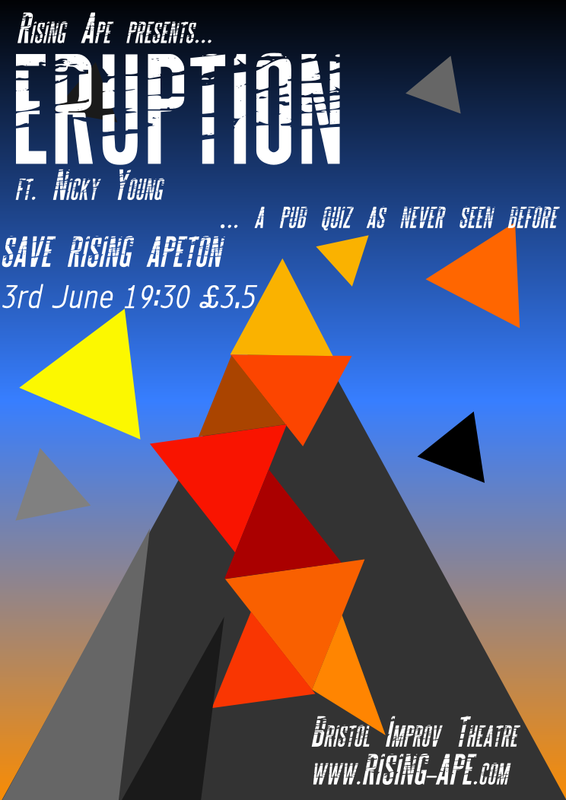 It’s fair to say that ‘Rising Ape Presents… Eruption!’ was a blast. You became vulcanologists for the evening, vulcanologists who knew a surprising amount about the career of Pierce Brosnan. Using your in-depth knowledge of lava flows, increasing pH levels and the correct pronunciation of Ejyafjallajokull you came to the aid of the perilously located town of Rising Apeton. You were then regaled by researcher Nicky Young and her tales of studying Hawaiian volcanoes and dodging Aberdeenian seagulls. Thank you once again for making it a fantastic evening (and some of the most tortuous quiz team names ever imagined)! There was just one problem. The next day, when your work colleagues asked what you did the night before, they probably didn’t believe you, it all sounded so incredible. That’s where we can help. Please enjoy the video evidence of your heroics in our highlights reel below, and show those doubting friends of yours what they missed out on. We hope you like it. Finally, a massive cheers to the highly professional crew of Raw Frames for making the film. We can heartily recommend them to anyone looking for a video of their event. Rising Ape returns with a real lava palaver! What’s your mission? To work out how to save Rising Apeton. As always, you’ll need your best quiz heads on, and of course the winning team will get a sizzling prize. 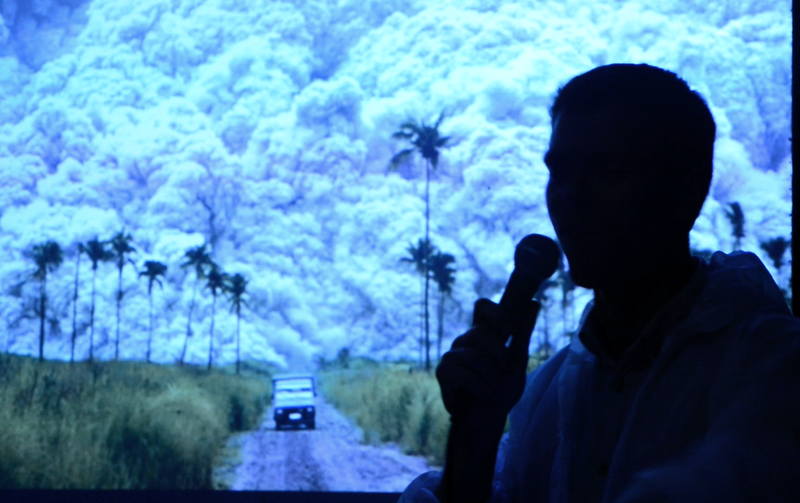 The night will end with an incandescent talk from bubbling volcanic researcher Nicky Young. So come along, grab a drink, and get planning! Nicky Young studies volcanoes as a PhD candidate at the University of Bristol. An early love of rock-hounding and geology-based movies such as Dantes Peak, Volcano, and Journey to the Centre of the Earth (factual or not as they may be) led her to beginning a Geology MSci at Bristol 6 years ago. This was followed by a 6 month stint in Hawaii at the Volcano Observatory where Nicky explored the signals Kilaeau volcano emitted to try and discern volcanic movement. Since then studying volcanoes has been her passion, which is why she returned to Bristol for a PhD. She studies the movement of active volcanoes to understand what is happening deep below our feet.